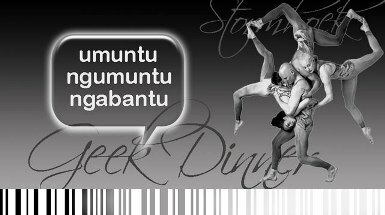 South Africaâ€™s first official Geek Dinner is happening next Wednesday, and youâ€™re invited! The theme is Umuntu Ngumuntu Ngabantu :: Collective Intelligence in South Africa 2.0. There are a couple of very cool speakers who will share their knowledge with us on the night, and hopefully thereâ€™ll be time for a couple of crowdsourced talks too. The Geek Dinners are not about the wine though. Theyâ€™re about sharing cool ideas and meeting people who have similar interests. If youâ€™re in Cape Town next week and youâ€™re a blogger, a geek, or just curious then weâ€™d love to meet you! Please add yourself to the wiki, or email me if youâ€™re joining us.